Though many of my favorite flying activities — aerobatics, pattern work, sightseeing — are local in nature, there’s no denying that airplanes are made for going places. Even the pokiest of ’em makes travel faster and more interesting than driving a car. One of my most memorable trips was flying a clipped-wing Cub up the California coast at 60 mph. Between fuel stops and detours, it took the better part of a day to cover the 145 nautical mile straight-line distance from Orange County to Lompoc. But boy was it fun! But if I had to choose just one place to call my all-time favorite, it wouldn’t even be a contest: it starts and ends with Santa Catalina, one of eight isles in the Channel Islands archipelago which sit just off the Southern California coast. Catalina seems to be a place where all aerial roads meet, especially if you’re from this area. It’s the place everyone wants to go as soon as they learn how to fly or come into town for a visit. The pilot I made my last trip with in the Gulfstream used to fly for Catalina Flying Boats, a company which transports cargo to and from the island in DC-3s and (at the time) Beech 18s. My aunt used to regale me with stories of the huge dances which took place in the legendary Casino ballroom in the 1930s and 40s. She’d work a 9-to-5 job during the day, then take a ferry (which had it’s own band and dance floor aboard) to Catalina in order to dance the night away with thousands of other people in front of a big band. CBS Radio would broadcast live from the ballroom. After the music ended sometime in the wee hours, she’d hop on the last ferry and again dance all the way back to the mainland. The airport itself is reason enough to visit the island. Built by chewing gum titan William Wrigley in the late 1930’s, it was specifically designed to handle the Douglas DC-3 which would bring his Chicago Cubs out to the island for spring training. But Catalina’s aviation history goes back a lot further than that. Glenn Martin built an airplane in Santa Ana and set a record for the world’s longest over-water flight in 1912 by piloting it to Catalina Island. To this day, the airport terminal retains its original art deco style. Speaking of which, the airport itself features a restaurant, camping area, a nature center showing the natural history of the island, a gift shop, and occasional barbeques on the airport’s huge rotisserie grill. The terminal also contains a gallery of photos covering Catalina’s aviation history, starting with the earliest flying boats to visit the island. 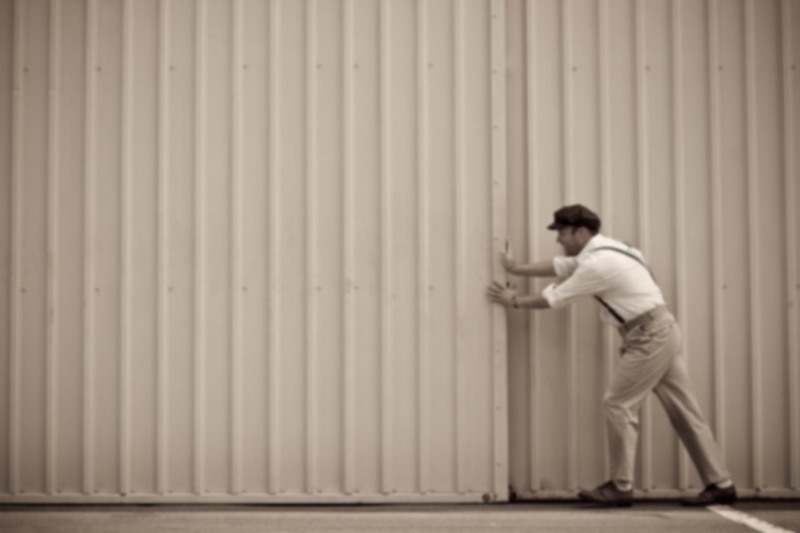 You’ll see pictures of the airport’s construction, and of the World War II era when the nearly-completed airfield was barricaded with barbed wire and other obstacles in anticipation of a Japanese invasion. For some reason, people get bent out of shape about flying to Catalina. It’s really not that hard. The airport does sit on a bluff 1,600 feet above the ocean, but the pavement is plenty long and wide. There are just a few things to remember about the field. First, when you’re at pattern altitude (2,600′ MSL), you may be 1,000 feet above the airport elevation, but at times that will put you 2,600 feet above the surface, especially on base leg when you’re over water. Also, there’s a crown in the middle of the runway, so the first half of the landing roll is uphill and the second half downhill. It’s not terribly drastic, but it can create the visual illusion of coming up on the end of the runway when you’ve still got plenty left in front of you. Finally, you’ll sometimes encounter up and down drafts due to the mountainous terrain when the wind blows. Like all approaches, if you don’t like it, go around. No big deal. Today, about 90% of the island is owned by a non-profit organization dedicated to preserving Catalina. They do a wonderful job balancing the conservancy needs of the island with it’s status as a tourist destination. Over a million people each year visit Catalina, but you’d never know it from how pristine most it looks. I can only imagine how difficult it must be to bring materials and equipment out to the airport (which sits alone in the middle of the island) to work on the runway. It’s one of the reasons I don’t mind the $25 landing fee too much. It’s expensive, but at least it’s going to a non-profit conservancy which is protecting both the island and the airport. Though I haven’t been to AVX on a regular basis in several years, I used to make a habit of occasionally flying over to the island for a leisurely day off. Sometimes I’d hike, other days I’d take the bus into Avalon or Two Harbors. Occasionally I’d just hang out on the back patio at the airport, reading a book, memorizing an opera, or talking with other pilots. One day I ran into Harrison Ford; another time it was Lorenzo Lamas. You never know who you’ll come across when you’re at the Airport-in-the-Sky. Sometimes they’re not even people! I once witnessed a bison stampede from the airport terminal’s patio. Another time I encountered a Native American who was searching for some kind of mystic white buffalo. You can’t make stuff like this up. Fantastic Ron! I want to go. Too bad it’s 1746nm from where I’m based. Maybe if I find myself out on the West Coast I can get a tour! I’d be more than happy to git you over to Catalina if you ever find yourself out West! Just let me know. Isn’t that amazing, some of the best destinations are in our own backyard. But I think the best destinations are those that created a special memory with someone we love. I’m thinking you should go more often to Catalina. And… I suspect you could be a tour guide too. Great post! Thanks, Karlene! I probably could be a tour guide at this point. I’ve got a friend with a 1929 Travel Air biplane who’s looking to start a sightseeing service with his aircraft, and I encouraged him to add Catalina to the list if possible. Even if all you do is fly around the perimeter of the island, it’s still a wonderful thing. The smell of the salt air, the dramatic cliffs and surf breaking on the shore, all the hidden coves and crannies around the island, etc. It’s also true, the ones we fly with have a huge impact on how our destinations are remembered! Okay.. if he does the tour, I’m coming! There is something about salt air too…. brings back great memories. That was a great post! Been there 2-3 times by ferry but have yet to make the trip by air. Loved the history and stories, thanks Ron! The ferry trip is fun! Flying out is quite a different experience though. Hope you get the chance to do it sometime. If I’m ever headed that way with an empty seat I’ll give you a call. Hope Central America is treating you right! Wow Ron, I am certainly envious of your taking in West End in the UK. Having a Cocktail in St. Maartin (I want to go there so badly) You did not say in your post you were having a cocktail, I am just completing the memory myself 🙂 Flying that Cub at 500 AGL up the coast… Wow…. I’m only in my first lesson as a CFI and I am reading the “Savvy Flight Instructor” and it keeps reminding me that Flight Instruction is the “lowest rung in the industry.” (Yes, I know the rewards are tremendous giving others the gift of flight and imparting knowledge and skill…and thats why I am doing it, and it is a lot harder per say, in some ways than flying an airliner). I keep thinking, I spent ALL that money, just to hear I’m the lowest rung and no one will hire me? I too get ask, all the time “Oh, you will teach? Or fly charter? Why don’t you, or Why don’t you want to be a REAL commercial pilot and fly an airliner” Say my non industry type friends. I’ll tell you a little secret. I took my first solo in 1998. I have been flying non stop since then. I have been to every airport pretty much in the Basin. HHR, CPM, Fallbrook, VCV, Hesperia, UDD, TRM, you name it I’ve been there. BUT. Since I have been a pilot based in SNA, for over 20 years, the number of times I have been to AVX is a total of ONE. And it was by accident. Not because I dont like it. I LOVE AVX. I just think that its SOOO special, I want to keep that memory intact. I dont want to have it lose its magic. I want to go to AVX. Heck I want to go to AVX all the time, but I also love trying new places, like HAF. Actually, when I get a new pax, or someone who hasnt been in a small plane, I take them to IZA or PSP, just to get them a nice travel experience. I havent thought of taking them 10 minutes “up the road” to AVX. You are brave for going there immediately after getting your private. I know you say no biggie, but I’d like you to at least concur or concede that, at least if there isnt a fatality each year…someone is going off the end. In January, a homebuilt went down near the island and in October, a piper looks like went off the end. It DOES have its challenges (for the untrained pilot). I want to go again. I miss it. I just hope I get the opportunity ($) to go again soon. Don’t let anyone tell you instructing is the “lowest rung”. Like every other gig, it is what you make of it. In fact, one could argue that it is the “most important” rung and plays a huge role in flight safety. Besides, most professional pilots fly the same type of aircraft every day. CFIs are one of the few who can fly a dozen of different types of airplanes on a regular basis. You’ll meet great people and be surrounded by individuals who want to be at the airport, folks with passion and drive. And instructing will make YOU a better pilot as well; you learn a lot from watching others fly. You might want to think about revisiting Catalina — imagine all the memories you’re missing out on by staying away. I’ve been there dozens of times and it has never lost its magic for me. As for landing there, it does have some challenges, but so does every other airport. I searched the NTSB database for accidents using the AVX identifier, and over the 10 years found four fatal accidents. One of them was a C182 pilot who had a heart attack two miles from the airport while on approach. Another was a M20J whose 74 year old pilot had 25 hours in the airplane and hadn’t been to AVX since 1983. Yet another was an A36 pilot who lost control of the airplane in the clouds after departure. The last one was an FAA safety inspector and a Designated Pilot Examiner — both quite experienced — who ended up in the water for undetermined reasons. During the past 10 years, there have been three non-fatal accidents. Two of the three were fuel exhaustion, the remaining one was a hard landing which the pilot attributed to a downdraft. That’s last incident is the only one that I can see being directly related to the airport itself. Interesting about the Database. 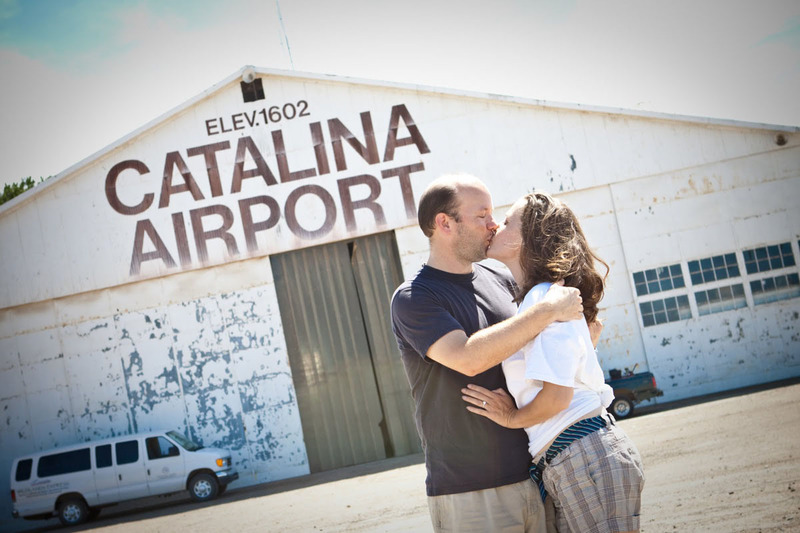 I know of local operation that does Catalina tours by air. They are out of AJO and they do approx 2 – 3 tours each day. All of the tour pilots seem to state otherwise, and I have seen many pictures, just in the last year, that they have taken of several different aircraft that are, shall we say, “less than aerodynamic looking” after a mishap with AVX. This is also congruent with what the administrators who work at the AVX office up there where you pay the fee. Perhaps the NTSB database is inconclusive or just not complete. I dont know really whats what. This is all hearsay, I’m just saying what I have heard. I have an open mind though and an eager to learn as much as I can. It’s certainly possible that the database is not complete. Not everything gets reported, and those that are don’t necessarily show up there for quite a while. Also, not every mishap reaches the level of a reportable accident under NTSB Part 830. Gear up landings, prop strikes, ground loops, and so on will probably not appear since they do not reach the requisite threshold. My wife and I celebrated mothers day last year by loading our two young daughters in the mighty skyhawk and flying to AVX. Of all the far flung places she and I have been, we had forgotten what was right in our own backyard. The girls were awed by the Buffalo and the spectacular views on the bus ride to town. It is most definetly their new favorite destination. Hopefully soon they will each get to experience the island from the front of a little yellow plane with the door and window wide open! I bet that trip will always be a cherished memory! And it’ll only get better in the Cub. It’s such a perfect accoutrement to a Catalina flight because it was created during same era as the airport and the island’s “golden age”, not to mention the amazing visibility you get from the tandem seating. Until I started flying the J-3, I never realized how the windows of a typical GA aircraft affect how we see the world outside. Between the green-ish tint, crazing, and haze of an older window, you don’t get anywhere near the same experience as an unobstructed opening. Enjoy the ferry flight — it’ll be a experience you’ll never forget! Okay Ron, I’m definitely going there someday. I’ve yet to take my wife flying, but hopefully that will happen either late summer or early fall. I hope and pray she loves flying…I think Santa Catalina would be a great destination to help change her mind if she doesn’t! Great article brother! 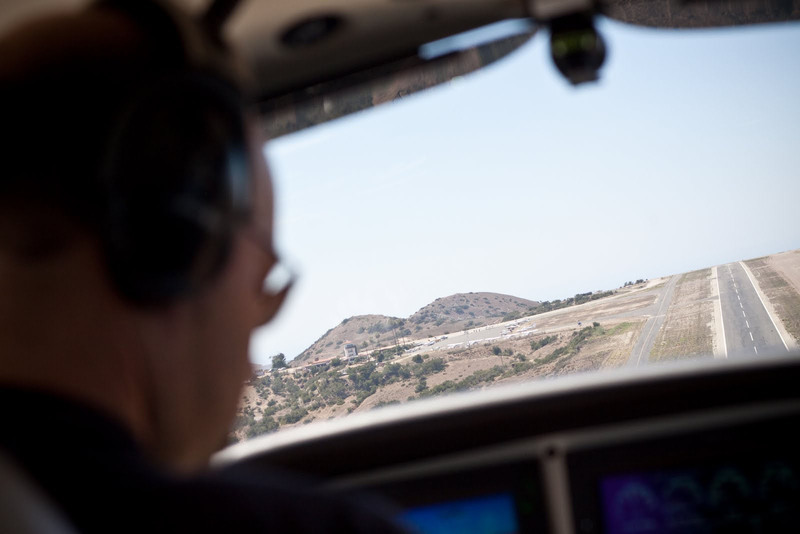 You reminded me of another virtue of the Catalina sojourn: it’s a short flight from just about anywhere in the L.A. basin, which makes it great for introducing people to general aviation. I hope your wife enjoys the trip! We are blessed that our oldest son, Bear, has been at the Cherry Point Boy Scout Camp as an employee about 18 years, We have made many trips to the Island. Seems like most of the people who live in the area have a tail or two about the Air Port there. We were there one time when a Russian family over shot the runway. They were unharmed, but the bottom of the plane was gone. We love the Bufflo Burgers at the Air Port as well as the shopping in Avalon. The people of Catalina are wonderful hosts. Great post, Ron! Been there by ferry once – now I’ll make it a point to get back again by plane! I didn’t even know all the fuss about landing in catalina, to me, each trip was a non event, only an occasional left over marine layers that still hung around the path of the final approach path might’ve obstructed the view a bit. a little side slip solved the problem, scared my pax a bit 🙂 but hey…. Ah, Calexico! You must be referring to Rosa’s Plane Food, right on the field. I know it well — a client of mine has a factory down there and we used to fly into CXL twice a week from Orange County. It’s a very pleasant flight: you get the ocean views on takeoff, then majestic mountains along the way, and eventually you’re dropped into a large valley with farmland and occasional views of the Blue Angels practicing at El Centro. Really enjoyed reading this entry, Ron. As was the case with you, KAVX was my first destination with a passenger after earning my private back in 1989. I was a freshman in college. 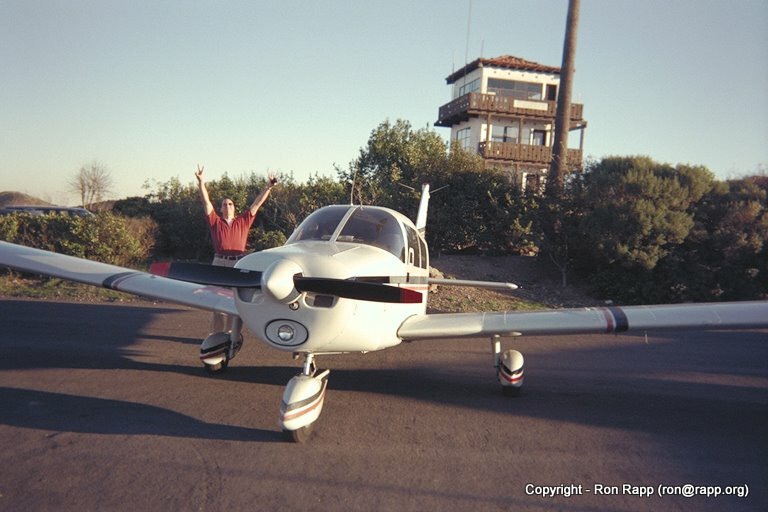 A friend and I flew a Piper Archer II N47885 from KMYF in SD and after a quick lap or two around the island we landed and enjoyed burgers on the deck. I don’t recall being intimidated by the cliffs at either end of the runway but on my many visits I always erred on the side of caution and carried a little extra altitude and airspeed on approach. After college the cost of aviation and the reality of a low paying first job put the brakes on my flying. Now 20 years later I recently earned my ticket back. I’ve been busy flying all over southern CA but haven’t made it back to Catalina yet. I look forward to it in the near future. Glad you enjoyed the post, Rod. AVX is a wonderful “first passenger” destination. Congratulations on freshening up your certificate and getting back in the air!